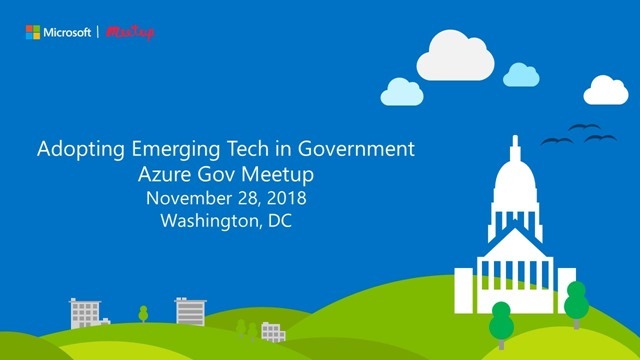 Join us as we discuss the leading edge of emerging technology in government at the next Microsoft Azure Government DC meetup, Adopting Emerging Tech in Government, on Wednesday, November 28, 2018 from 6:00 to 8:30 PM Eastern Time at 1776 in Washington, DC. If you’re not in the DC-metro area, we invite you to join us via livestream starting at 6:35 PM Eastern Time at aka.ms/azuregovmeetuplive. You’ll hear how agencies are approaching strategy, challenges, use cases, and workforce readiness as they leverage emerging tech to innovate for their mission including blockchain, artificial intelligence, machine learning, and augmented reality. RSVP and join us to gain insight from innovators across government agencies who are exploring ways to apply emerging tech to empower their workforce and deliver innovative services to the public. The Azure Government DC user community was created as a place to bring together professionals interested in learning about government innovation, especially around cloud computing technologies and capabilities. The community was launched in February 2016 by Karina Homme, Senior Director of Azure Government and Vishwas Lele, CTO of AIS and Microsoft Azure MVP. The community hosts monthly meetups, which are free and open to the public, in Washington, DC and via livestream. Currently, the Azure Government DC user community is comprised of more than 2,000 members and growing. We invite you to visit our site to join us.